Look at that face! My sweet pupper! Yes, I am that dog mom and yes, I make my dog homemade food. This is a result of several things which I dig into in this post. But mostly, I make my dog’s food because I think it’s healthier for her and she likes it. Even if you don’t plan to make all your dog’s food, I think making them some fresh food to go along with their kibble is always nice! I know, I know. People think I’m crazy for making my dog’s food. Mimi, my 14 year old 7lb yorkiepoo, has always been a picky eater. I’ve read about picky eater dogs and apparently the technical term is “non-food motivated dog.” I had never met a dog who didn’t love food until Mimi either. I’m not really sure how common it is! That being said, getting my dog to eat was always a struggle. I finally found a kibble that she would eat and it was discontinued at my local store. Around that same time, several dog food companies were recalling food and treats that were contaminated and were killing dogs. Scary times. I began researching dog food and found out that dog food is not held to nearly as safe of standards as human food. This really scared me! In my research, I also came across several articles that stated that traditional dog food kibble was a result of wartime rations. Basically, during WWII all metal and tin was mandated to be used to make weapons, etc. for the war. Dog food at that time mostly came in tin cans, much like the wet dog food on the market today. Kibble was made to provide pets nutrition in a shelf-stable food that could be bought and sold in bags. When the war was over, Americans had become so accustom to the convenience of dog kibble that it just stuck. This is all my research, and you should definitely do your own! For my dog, I began to experiment with at-home recipes. Mimi was really enjoying the food, so I kept going with it. I consulted with my vet and we tested Mimi’s blood to make sure that my at-home diet was providing Mimi with all the nutrition she needed. And every year, her blood work comes back with flying colors! I found in my research that dogs are scavengers by nature. In the wild, dogs will eat whatever they can find. Grass, tree bark, trash and yes, of course, meat. So, if your dog is generally healthy, she might do really well with a home diet but you should definitely consult with your vet and do what is right for YOUR dog. But is it ok for dogs to eat people food? Umm, you mean food? To me, feeding your dog solely kibble is like eating dry, fortified cereal everyday. This isn’t a judgement. My dog is easy to feed at home because she is so small and doesn’t eat very much. If I had a 100lb dog, making their food everyday would be a lot of work! To me, feeding your dog meat and vegetables is the most natural thing you can do. I am not saying Mimi has never snuck off with a piece of pizza before or that I don’t let her nibble the occasional ice cream, but generally, I feed her vegetables and meat, with a little bit of oats, and she has done really, really well on this diet. I still let her have treats like Puperonis and Greenies but her two meals of the day are this recipe! Begin by soaking the oats in 3/4 cup of water. Stir vigorously and let sit. In a large pan, sauté the frozen veggies until cooked through and softened. Put cooked veggies into a food processor and process until they are small but do not over process or they will get liquid-y. See photo. Brown chicken and beef until completely cooked through. Depending on pan size, you may need to brown these separately. Drain fat from meat. Drain water from oats and combine with meat. Add veggies. Portion out about five meals and put into an airtight container and store in the fridge. Place remaining food into a freezer bag and freeze until ready to eat. *BMW and I will often 2x or 3x this recipe and make several bags to keep in the freezer. We batch make her food to make our lives a little easier. This is also great for when we go on long trips, Mimi’s babysitter or our parents can easily defrost a bag for her when they need to! **This recipe usually only keeps fresh for about 7 days in the fridge. Any longer and it starts to get funky. I have been approached by lots of dog food companies to push their products and I always say no. I am extremely picky about what I feed my senior pet! I want her to live as long and healthy as possible so while I let her have treats and don’t freak out if people feed her at dinner parties, I do make sure she has two nutritionally solid meals a day. We did try Grocery Pup. Mainly, because when I read the ingredients, I found them to be almost exactly what I was already making for Mimi. She ate the food and seemed to enjoy it, especially the beef one. 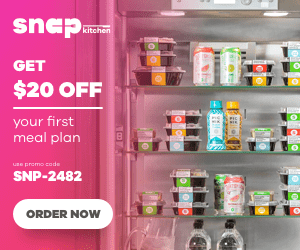 If you’re not ready to start making your dog’s food every week, it might be worth checking out Grocery Pup (they deliver but you need to be home because it arrives frozen!) to see if it might be right for you and your dog!